Happy Wednesday! I am so behind in my Easter projects, the day job has been so busy lately! I needed spring colours big time, the snow is almost gone but that means heavy rains to clean it away! I know the sun is just around the corner but I have had enough of grey days! I started by stamping multiples of the tulip image from Winnie and Walter's In Bloom - Addie's Garden and Copic colouring them with different pastel/Easter colours. I then decided to try the Laura Bassen "Smooshing" technique on Tim Holtz watercolor card stock for the background piece. I used Shaded Lilac, Squeezed Lemonade and a mix of Spun Sugar and Picked Raspberry (mixed to lighten the pink tone) Distress Inks. I then fussy cut my tulips and decided to die cut some older MFT stems in Lawn Fawn celery card stock and added some Mowed Lawn Distress Inks for shading. 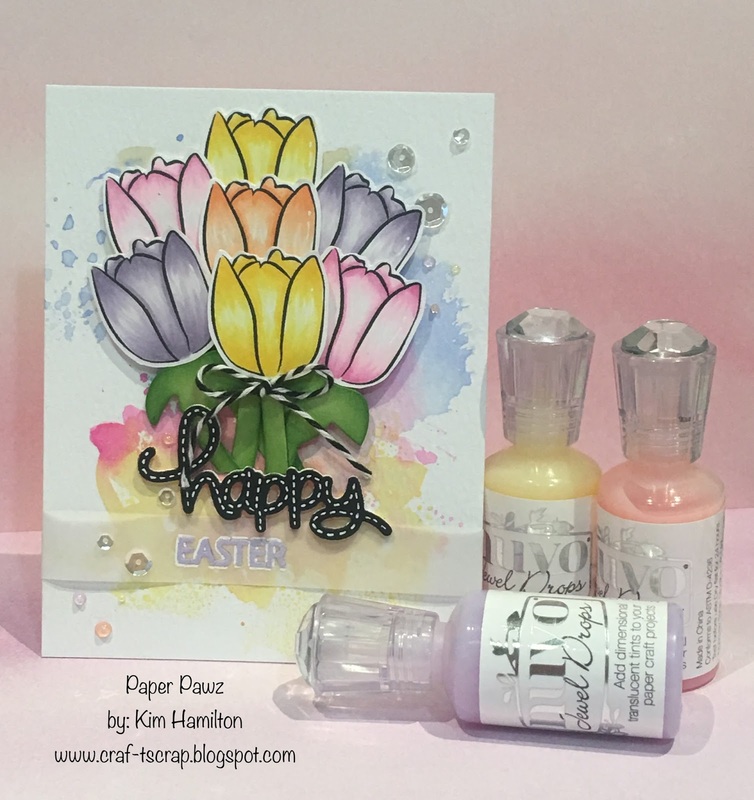 I put all of my flowers and stems on the base and decided to use my new favourite Happy die by Lawn Fawn from their Happy, happy, happy set in black card stock with fun foam for dimension. 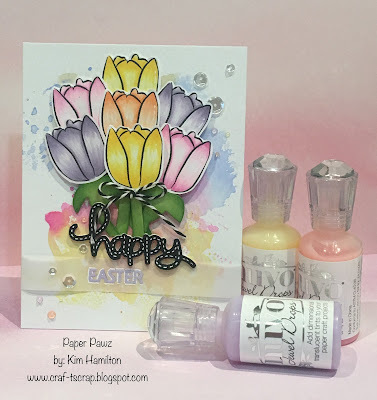 I decided to embossed the Easter sentiment also by Lawn Fawn in some Lavender embossing powder. I felt it was a little faint so I outlined the letters with my white gell pen and added dotted detail to my black sentiment to make it pop as well. Finished it all off with some sparkling clear sequins by Pretty Pink Posh and a mix of Nuvo Jewel Drops.